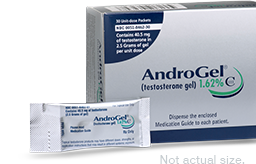 AndroGel 1.62% is a topical testosterone replacement therapy gel available in a metered-dose pump or travel-ready packets. Before you prescribe, get familiar with the patient journey. Safety and efficacy of AndroGel 1% and 1.62% in men with “age-related hypogonadism” (also referred to as “late-onset hypogonadism”) have not been established. Safety and efficacy of AndroGel in males less than 18 years old have not been established. Virilization has been reported in children who were secondarily exposed to testosterone gel. Children should avoid contact with unwashed or unclothed application sites in men using testosterone gel. AndroGel is contraindicated in men with breast cancer or known or suspected prostate cancer, and in women who are or may become pregnant or are breastfeeding, as testosterone may cause fetal harm. Monitor patients with benign prostatic hyperplasia (BPH) treated with androgens due to an increased risk for worsening signs and symptoms of BPH. Patients treated with androgens may be at increased risk for prostate cancer and should be evaluated prior to initiating and during treatment with androgens. Monitor prostate specific antigen (PSA) levels periodically. Avoid unintentional exposure of women or children to AndroGel. Secondary exposure to testosterone can produce signs of virilization. Exposure of a pregnant woman to AndroGel may result in potential hazard to the fetus. AndroGel should be promptly discontinued until the cause of virilization is identified. Increases in hematocrit, reflective of increases in red blood cell mass, may require lowering or discontinuation of testosterone. An increase in red blood cell mass may increase the risk of thromboembolic events. Monitor hematocrit prior to and periodically during treatment. Monitor hemoglobin periodically. Venous thromboembolism (VTE), including deep vein thrombosis (DVT) and pulmonary embolism (PE), have been reported in patients using testosterone products such as AndroGel. Evaluate patients with signs or symptoms consistent with DVT or PE and, if a VTE is suspected, discontinue AndroGel and initiate appropriate workup and management. Some studies, but not all, have reported an increased risk of major cardiovascular events (MACE) in association with use of testosterone replacement therapy in men. Patients should be informed of this possible risk when deciding whether to use or to continue to use AndroGel. Testosterone has been subject to abuse, typically at doses higher than recommended for the approved indication and in combination with other anabolic androgenic steroids. Anabolic androgenic steroid abuse can lead to serious cardiovascular and psychiatric adverse reactions. If abuse is suspected, check serum testosterone concentrations and counsel patients concerning the serious adverse reactions associated with abuse. Conversely, consider the possibility of testosterone and anabolic androgenic steroid abuse in suspected patients who present with serious cardiovascular or psychiatric adverse events. AndroGel is not indicated for use in women. Treatment with AndroGel may lead to azoospermia; edema, which may be serious in patients with preexisting cardiac, renal, or hepatic disease or in patients taking adrenocorticotropic hormone (ACTH) or corticosteroids; gynecomastia; sleep apnea, especially in those with risk factors; changes in insulin sensitivity or glycemic control; and changes in anticoagulant activity. Treatment with androgens may lead to serious hepatic effects. AndroGel is not known to cause these adverse effects. Monitor liver function tests (LFTs) periodically. Changes in serum lipid profile may require dose adjustment or discontinuation of testosterone therapy. Monitor lipid concentrations periodically. Androgens should be used with caution in cancer patients at risk of hypercalcemia (and associated hypercalciuria). Regular monitoring of serum calcium concentrations is recommended in these patients. Most common adverse reaction of AndroGel 1.62% (incidence ≥5%) is an increase in prostate specific antigen (PSA). Most common adverse reactions of AndroGel 1% (incidence ≥5%) are acne, application site reactions, abnormal lab tests, and prostatic disorders. Dosage and administration for AndroGel 1.62% differs from AndroGel 1%. AndroGel is not interchangeable with other topical testosterone products. There are insufficient long-term safety data in geriatric patients using AndroGel to assess the potentially increased risks of cardiovascular disease and prostate cancer. Please click here for full Prescribing Information, including BOXED WARNING on Secondary Exposure, for AndroGel 1% and AndroGel 1.62%.